GOOD BBQ is a tall order here in NYC. Having lived in TX and traveled to TN, I have sampled some succulent fare in my time. 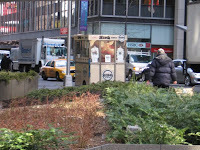 Here in NY, ever chasing the elusive/delicious BBQ, I have had my share of stinkers. I enjoy a good brisket, but my dish of choice is pulled pork. It's what I'm mostly likely to order at each restaurant and compare to previous samplings. I was discussing this with my friend MK, a BBQ aficionado. 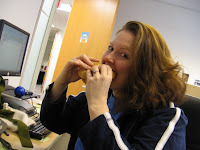 She had just returned from South Carolina, where she and her boyfriend had eaten both praiseworthy and paltry offerings. 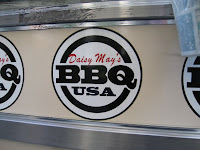 While discussing this with MK, the craving hit us, and I remembered Daisy May's BBQ--located at 46th street and 11th Avenue-- has a renowned cart somewhere in midtown. We (having finished most of our work for the day anyway, mind you) quickly set about googling, and almost simultaneously found the answer: IT WAS ONE BLOCK AWAY FROM US. 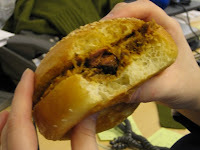 Does God really intervene when it comes to something as simple as a hankering for a hunk of pork? It sure seemed like it today. We bundled up and dashed outside, braving the brisk, icy wind for some quick and affordable street meat. We both ordered the pulled pork ($8 for the generous portion of meat, roll & cole slaw), and opted to split a mason jar of their mint sweet tea! MINT!!! The mint sweet tea costs 4 dollars, which initially had me saying hell to the no. Then I saw that it came in a Mason jar, and I offered to split it with Mel. It's DEFINITELY a two-portion serving. The sweet tea was sweet, but in the most wonderful of ways. Sometimes sweet tea can be SO sweet that it makes your teeth hurt. This tea was a perfect balance: strong tea flavor with just enough sweetness to make you smile. The mint wasn't as strong as I expected, but that was just fine. Mel let me have the glass that had the fresh mint sprig. She's a good friend. ;) I was actually sad when I took my last few sips of this tea. A good friend is also someone who takes cheesy photos of you (read: me) without judging you (again: me). Just one of her many wonderful qualities. 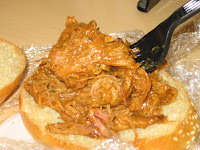 So this sandwich might not be the world's best BBQ, but on a day when some tasty, tender pulled pork is all I wanted, this definitely came close enough. And that sweet tea will have me coming back again, especially once it starts warming up outside! I made dinner for my BF on Valentine's Day. I made one of my favorite dishes, Chicken Tarragon, along with sauteed mushrooms, pan-crisped potatoes, and a salad of mixed greens with balsamic vinaigrette. I've cooked for him before, but that night I was especially nervous. I'd put on a cute blue dress with a knit sweater, put up my hair, donned some pearls, and looked damn cute. And then as soon as I stepped into the kitchen, I started shvitzing! I was 3/4 of the way through my chicken tarragon when I realized I'd FORGOTTEN THE CHICKEN BROTH. I had none (I usually keep extra in the freezer but hadn't replaced it lately) and it was too late to run out and get some. So I added a mixture of white wine and half-n-half and called it a day. The chicken was okay, not great. The BF didn't seem to notice, as he's never had this dish before, but I tasted a noticeable difference. Hopefully, dessert would save the day. And save the day it did. The author of this NYT article promises that no one will remember if dinner is a flop, provided you make these molten chocolate cakes. Holy CRAP was she right. 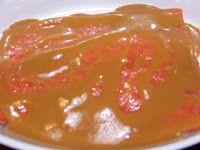 This is one of the BF's favorite desserts, and I must say I enjoy them a lot myself, but I'd never dared to make them before. From scratch! 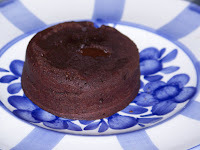 I used some Venezuelan chocolate that had bloomed, but was supposed to still taste fine, despite its snowy white exterior. 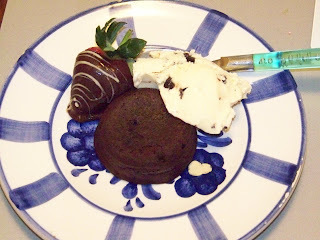 In a matter of minutes, the batter was in the oven and I was curled up on the couch with my Valentine. 7 minutes later, they popped right out of their ramekins (the recipe is for 2 cakes, but for some reason I doubted this and put it in 4 separate dishes, so the cakes are a little shorter than they should be) and I served them with a scoop of vanilla ice cream. Results? UTTER DELICIOUSNESS. 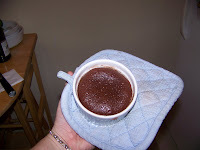 Seriously--the rich, delicious chocolate cake had the trademark ooze in the center, and I couldn't believe how well they turned out! We had the other 2 today (Sunday) for a mid-day treat, and while the center was no longer molten, they were still super scrumptious. I MADE THESE!!! AND THEY WERE AWESOME! I find Ina Garten's show so soothing. There is just something about her that makes me love her. Her show is set in the Hamptons, which automatically makes me want to distance myself, but then I remember the Hamptons isn't COMPLETELY about Puffy's White Party and bratty PR girls running over folks in parking lots. And Ina makes me "want to go to there" and hang out at her OUTRAGEOUSLY gorgeous house (if I could have only one house in the world it would look an awful lot like hers) and eat her delicious food and listen to her serene, friendly voice as I fell into a well-earned food coma. Where was I? Oh yes--she did a show ages ago on an Asian Salmon dish that gets rave reviews. 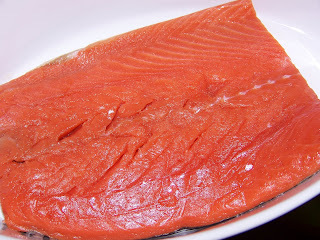 I'm trying to eat more fish anyway, and I LOOOVE salmon, so I saved it on my DVR and watched it far too many times before finally making it. It just couldn't be simpler: soy sauce, Dijon mustard, olive oil and minced garlic! 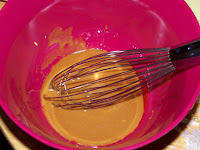 Whisk, pour half over raw fish, cover and refrigerate for a while. The rest of the unused marinade will come in handy later. 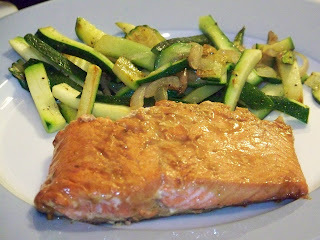 I ate half the salmon (it was a big piece) that night for dinner, along with some sauteed zucchini and shallots. It was good, but not as amazing as I expected. The LEFTOVERS, however.. woo! The next day I had it cold over some chopped romaine, and it was FANTASTIC. Lesson learned--it's good as dinner, EXCELLENT the next day served cold over some greens. 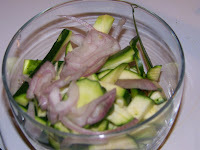 The leftover marinade (again, this portion did NOT come in contact with raw fish) made a super dressing, too. Tonight the BF & I were in the East Village when he asked if I'd like to get sushi. He said he remembered a really good place in the area. I said if HE didn't remember where it was, I had a really good place, too. 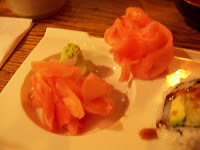 Carlota & I had been several times to this great place where rolls are half off! We kept walking, and BF said a few times, "Hmmm..I'm not sure if I remember where it is, but I think it's this way." Wouldn't you know, we stopped right outside the restaurant where Carlota & I had been? We were thinking of the same place! 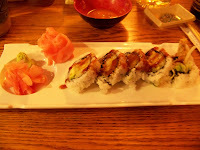 And this is what we ate: shrimp tempura roll for me (mmmm..shrimpy)....Carlota & I usually split a few rolls, but I just had this one, and a few bites from BF's sampler platter. I was fine then, but hours later, I'm hearing my stomach grumble. 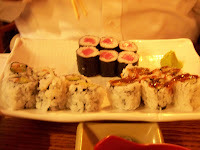 BF got the sampler meal with California, tuna & eel rolls. I had one of each, even though the mental picture of eel still freaks me out (ESPECIALLY after the eel challenge on Top Chef this season--eep!!) BF also gave me ALL of his pickled ginger, as ginger is one of his least-favorite flavors in the world. Score more for me! I also tried some of BF's Sapporo--I'd never tasted it before but it was quite good. Total for all that food, a beer, and a small salad? 21 bucks INCLUDING 20 percent tip. Who says NYC is expensive??? 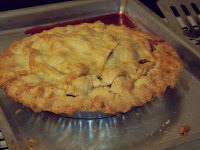 I'm working to become as comfortable baking as I am with cooking...and I'm learning that I can make one mean pie. These are shots of my cherry pie, which I made for Thanksgiving with my BF's family. There was a change in plans later in the evening, and we never got around to dessert, so the feedback (and the feeding) would have to wait. The BF & I had slivers of each pie later that night. I thought they came out alright, myself. 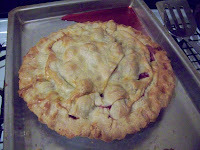 The cherry pie was much better than the pumpkin pie, which was a variation on a Smitten Kitchen recipe. This is the first time I DIDN'T fawn all over the results. 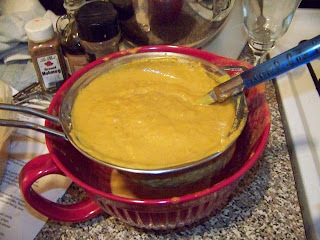 This recipe called for a can of sweet potatoes, and for you to push the filling through a sieve, making it silky smooth. Texture-wise it was noticeably smoother than regular pumpkin pie, but to me it tasted like.. well.. sweet potato pie. which is fine. 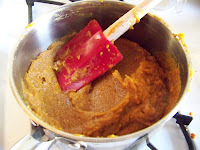 But I didn't push that filling through my insanely-fine sieve for 30 minutes to acheive something I did not prefer to my old standard, the tried and true Libby's pumpkin pie (yummmmmmm). This is in no way a reflection on Smitten Kitchen--just a show of my odd tastes. 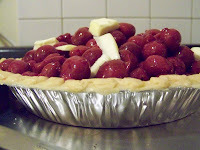 The cherry pie, however, is a favorite standout of mine. 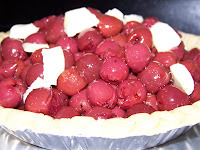 I don't normally like cooked fruit (yeah, i said it), but take some sour cherries and add some sugar, real butter, and a flaky crust, and I'm in 100 percent. 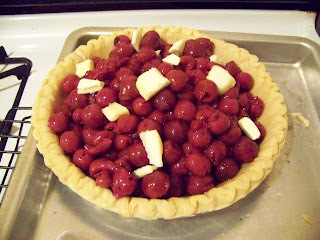 I also took the liberty of nearly doubling the amount of cherries. 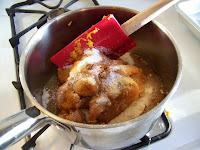 I took photos of the pumpkin pie-making process, but forgot to take a picture of the completed pie! And even though Smitten Kitchen warned me to make sure my sieve wasn't super-fine...it was. The pie just wasn't that spectacular, as I said, so I'm not too mad at myself for missing the finished product pic. I often cook for my friend/neighbor, Kelli, and she is only too happy to let me try new things, spring sudden recipes on her, etc. Many a Saturday morning she'll scuff up to my floor and join me for a very casual, very delicious big breakfast. She always jokes that she does all the eating and I do all the cooking, but she makes a killer guac, crazy-good scrambled eggs, and the best grilled cheese sandwiches I ever did taste, so it's not true. She also brought one of my new favorites into my life: Soft-boiled eggs. I know, I know. These haven't been news since like, Ought-three. Except to me. 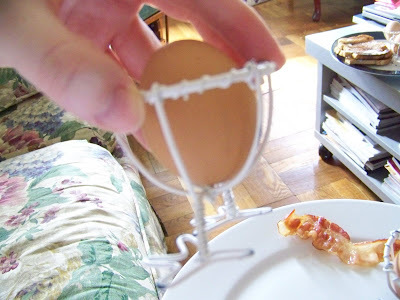 I was a reluctant egg eater for most of my life. The slightest sign of jiggly whites and the gag reflex was irrevocably engaged. My scrambled eggs had to be SO cooked they were almost like styrofoam. An omelet with the slightest hint of gelatinous-like appearance would go untouched. As I mentioned, I was kinda picky. But over the years I got over most of my hangups, and poached eggs are actually one of the few foods I never tire of eating for breakfast. 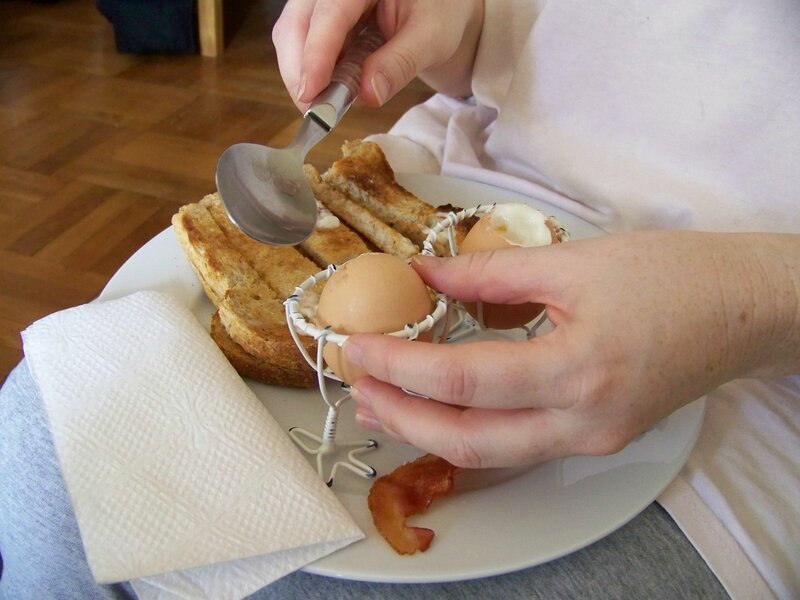 The soft-boiled eggs, however, still very much skeeved me out. But Kel had been a trouper and tried my zucchini sauté, my spicy hummus, my homemade meat sauce, and just about anything else I put on her plate, so I decided to give it a shot and try them. 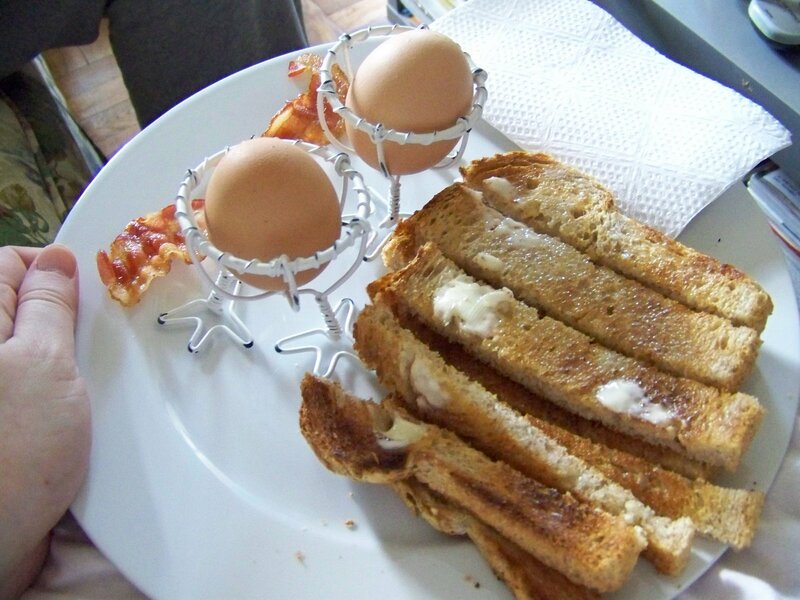 A few months ago she made them for me and while I enjoyed them, I didn't quite get it. 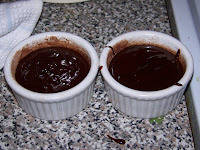 Then I got THESE babies from Williams-Sonoma and decided we should make them again. This time I left all the prep up to Kelli. I even let her (shudder) butter my toast. Yeah..you heard me right. When I eat scrambled eggs on toast, I don't butter the toast. Ew. Dry, please. Dry as sawdust. I don't like buttered toast unless it's going to be just that: buttered toast. No butter and jelly, no butter and sugar--just butter. But the butter, my dear readers, makes allll the difference. This was the road I had not taken lo those many months ago, and yea, verily, I regretted it. The saltiness of the toast slices just made the egg's creaminess even more heavenly. These were so tasty that I had them again that night for dinner. It takes 3 minutes to boil the eggs, during which time you can butter your toast, do the dishes, and dance a little jig in anticipation of the yumminess headed your way.